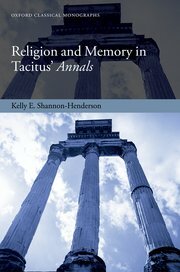 Kelly E. Shannon-Henderson, Religion and Memory in Tacitus' Annals, Oxford, 2019. Throughout his narrative of Julio-Claudian Rome in the Annals, Tacitus includes numerous references to the gods, fate, fortune, astrology, omens, temples, priests, the emperor cult, and other religious material. Though scholars have long considered Tacitus' discussion of religion of minor importance, this volume demonstrates the significance of such references to an understanding of the work as a whole by analyzing them using cultural memory theory, which views religious ritual as a key component in any society's efforts to create a lived version of the past that helps define cultural identity in the present. Tacitus, who was not only an historian, but also a member of Rome's quindecimviral priesthood, shows a marked interest in even the most detailed rituals of Roman religious life, yet his portrayal of religious material also suggests that the system is under threat with the advent of the principate. Some traditional rituals are forgotten as the shape of the Roman state changes while, simultaneously, a new form of cultic commemoration develops as deceased emperors are deified and the living emperor and his family members are treated in increasingly worshipful ways by his subjects. This study traces the deployment of religious material throughout Tacitus' narrative in order to show how he views the development of this cultic "amnesia" over time, from the reign of the cryptic, autocratic, and oddly mystical Tiberius, through Claudius' failed attempts at reviving tradition, to the final sacrilegious disasters of the impious Nero. As the first book-length treatment of religion in the Annals, it reveals how these references are a key vehicle for his assessment of the principate as a system of government, the activities of individual emperors, and their impact on Roman society and cultural identity.